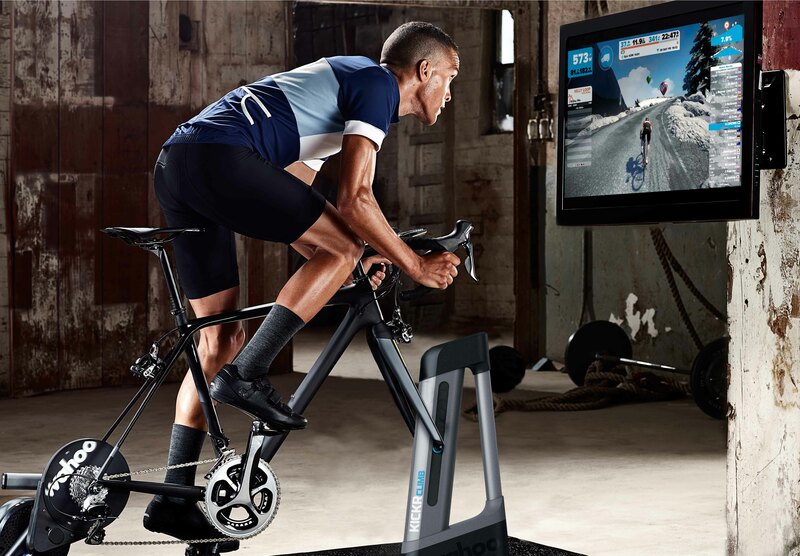 Like it or not – the indoor trainer is a regular part of life for most cyclists and triathletes. Either because of the convenience of getting your rides indoors, the consistency of workout you can get inside vs the real world, or if you are like us…because DCF would look negatively on abandoning our 4-year-old at home alone while we try to get a workout in. Fortunately, in the past few years, indoor training has gotten a lot more bearable thanks to products like Zwift that make indoor training competitive and collaborative. But a stationary trainer does have its limits. One of which being that no matter how much you ratchet up the wattage, you still were always looking straight ahead at the screen. 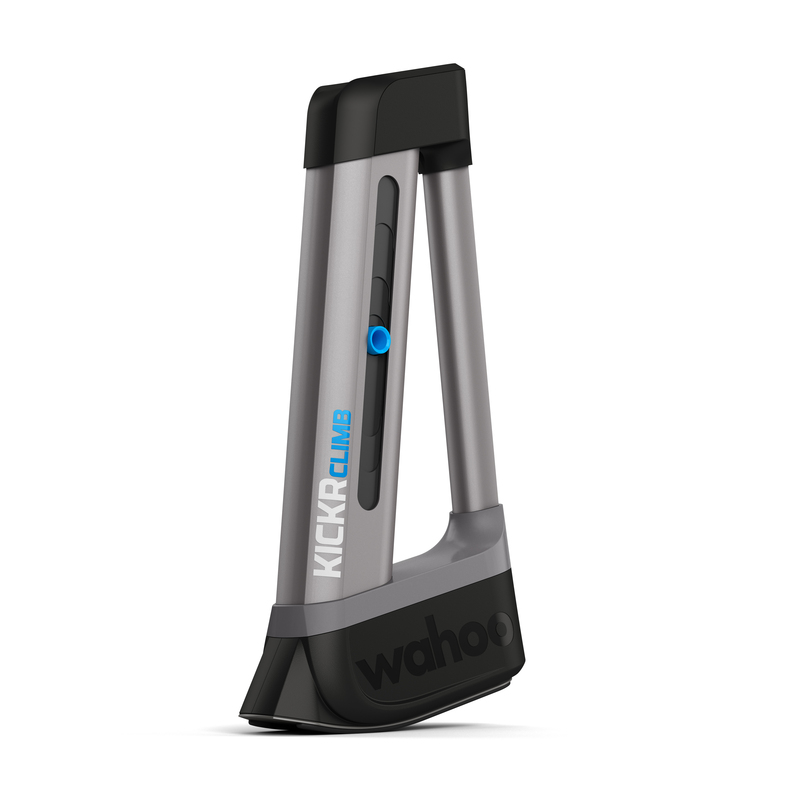 Today, Wahoo announced a new product that can change that – the KICKR CLIMB. “The world we ride in isn’t flat, which is why we believed the indoor riding experience on the KICKR should follow suit,” says Wahoo Fitness CEO, Chip Hawkins. “And as we continue to keep Wahoo at the leading edge of innovation in this category, we’re proud to quite literally take structured climbing workouts and virtual course rides to the next level,” continues Hawkins. When paired with the new KICKR and KICKR SNAP Smart Trainers, the KICKR CLIMB responds to workout and virtual course data in real-time, mimicking real roads and mountain climbs by raising and lowering the front fork of the rider’s bike to match ascents up to 20% and descents of -10%. These real-grade changes create a more immersive virtual riding experience, while also engaging climbing muscles and improving pedaling technique to enable the rider to become a more efficient and powerful climber. 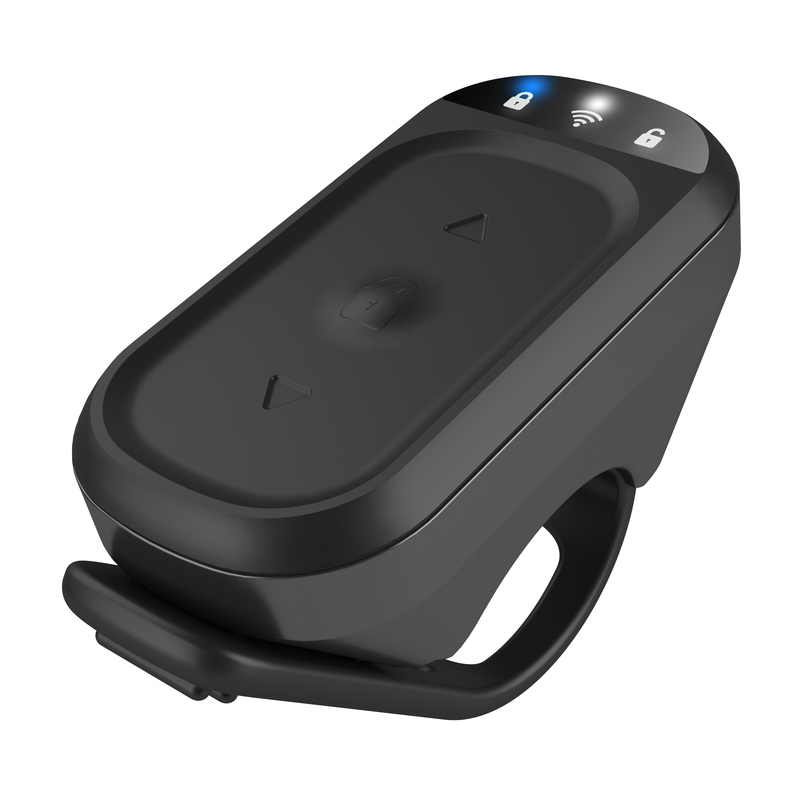 In addition to reacting to grade changes from external sources like Zwift, TrainerRoad, or from pre-loaded routes on Wahoo’s ELEMNT & ELEMNT BOLT GPS cycling computers, the KICKR CLIMB can be ‘locked,’ wherein it only responds to commands received from the bar-mounted remote, enabling the rider to manually adjust the grade with the simple press of a button. The KICKR CLIMB supports a wide range of modern hub configurations, including quick-release, 12×100, 15×100, and 15×110 thru axle hubs. 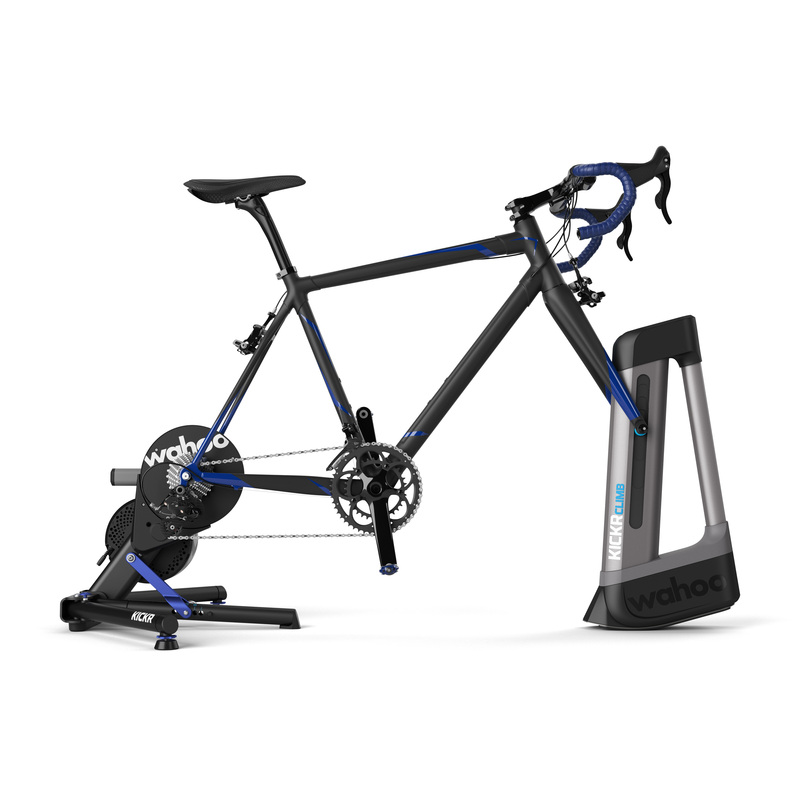 The KICKR CLIMB Indoor Trainer Grade Simulator will be available this fall at select specialty retailers and on WahooFitness.com for $599.99 USD. We are very excited to give the KICKR CLIMB a test. We are habitual Zwift users here at AG HQ, and the change to have the bike go up and down in response to the virtual world sounds particularly sweet. Lately our coach has been scheduling some 3- and 4-hour rides, and unfortunately, South Florida weather has not been as cooperative as we would like. So to have the trainer automatically raise and lower in response to the road ahead is going to really change the feel of that time on the bike. We do have a few concerns we are looking to evaluate in a long-term review. The first is how stable the CLIMB is, especially when you are rocking the bike through a Zwift sprint zone – or just going at Z5. Will there be any additional strain put on the fork? And we also can’t help but look at that price of $599.99 and hesitate to pull out our wallets. A KICKR SNAP retails for that same price, so now if you are looking for an ultimate pain cave setup, you just doubled your cost. And unfortunately if you want the CLIMB buying a new trainer (or your first trainer) will be part of the deal. The CLIMB functionality requires a 2017 KICKR or 2017 KICKR SNAP due to a small form factor issue that would have caused your bike to come into contact with your KICKR otherwise. Will the price of admission be worth it? Stay tuned for a long-term review!